I love Lemon Chicken. In China, Lemon Chicken is made with a whole chicken (skin and bones). 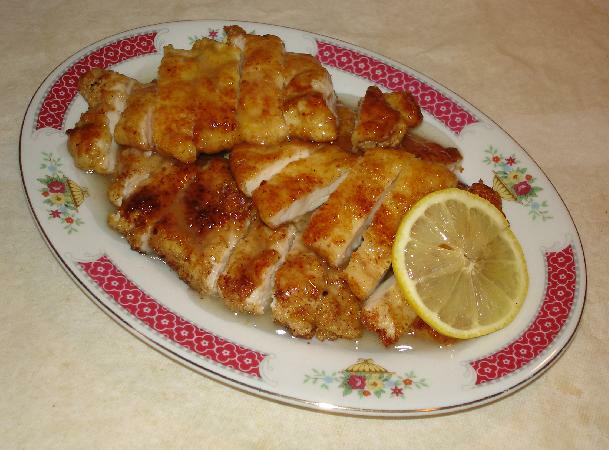 In USA, most Lemon Chicken dishes are made with boneless chicken breasts only. In most of the Chinese restaurants that I ordered this dish, either they used too much batter, or that the lemon sauce had very little lemon flavor but lot of yellow coloring. Here is my interpretation of the Lemon Chicken dish that I like. 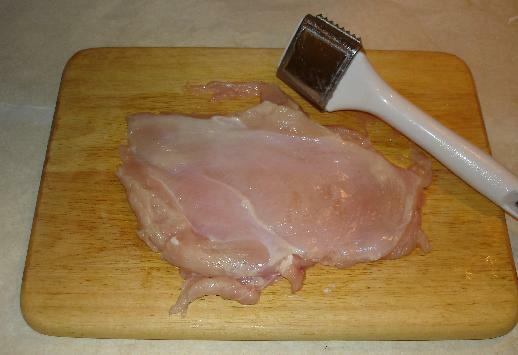 For each chicken breast, use the food mallet to pound slightly on the breast to flatten it. Trim off the fat. 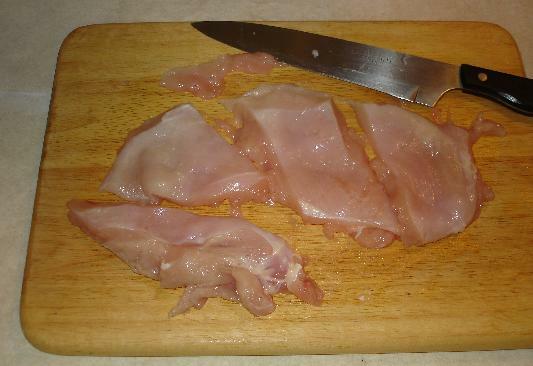 Cut each breast into about 4 pieces. Set them aside. Sprinkle a pinch of salt on the chicken breasts. (Suggest: 1 tsp total for 2 breasts). 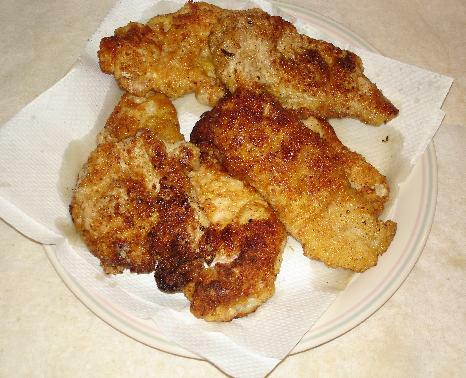 Optionally, you may sprinkle some fresh ground pepper on the chicken breast as well. Cut the lemon in half. Save 2 small slices for garnishing. 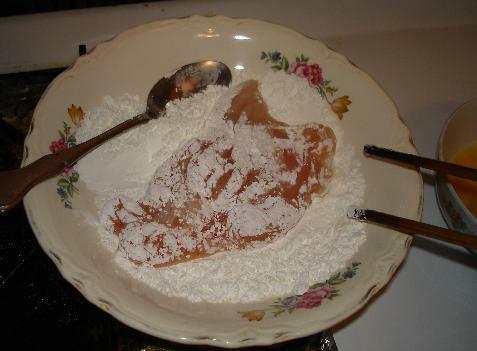 Prepare to coat the chicken breast before frying: Pour about 6 to 7 tblsp of corn starch on a swallow dish. Break one egg into a small bowl and scramble it. 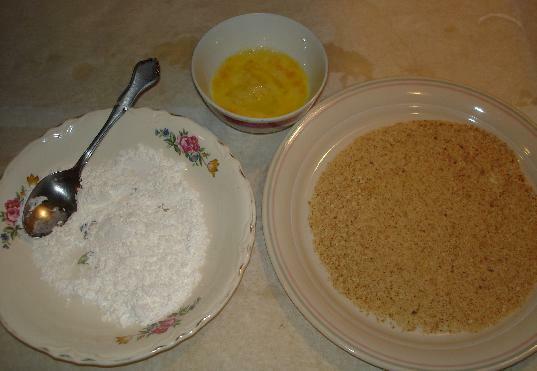 Pour about 1/2 cup of breadcrumbs onto a flat dish. Use a small pot, add 1 1/2 cup of lemonade. Set stove at high. Squeeze the juice from the fresh lemon into the pot (strain off the seeds). Add 5 to 6 tsp of sugar. 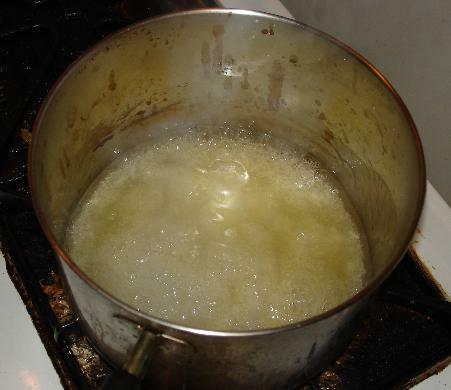 Bring the lemonade to a boil and continue to boil until the liquid has rougly reduced in half. On a second stove: Use a wok/pan, set stove at medium high, add a generous 7 to 8 tblsp of cooking oil. 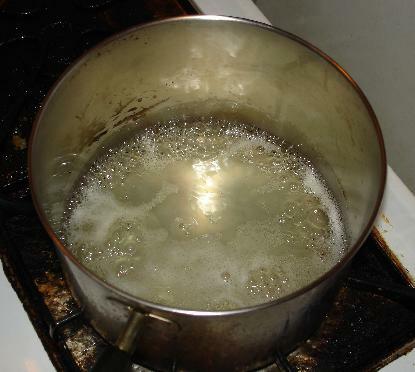 Heat the oil to frying temperature. For each piece of chicken breast patty, first dust it with some corn starch. 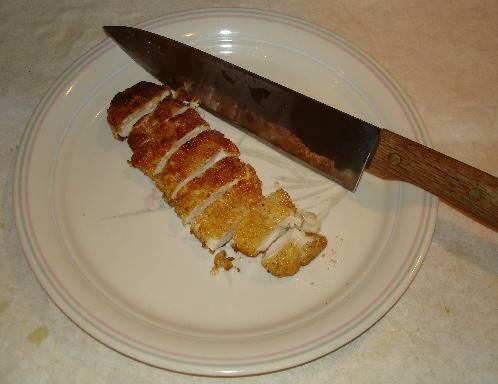 Try to cover the chicken meat the best you can. Then coat the chicken breast with some eggs. 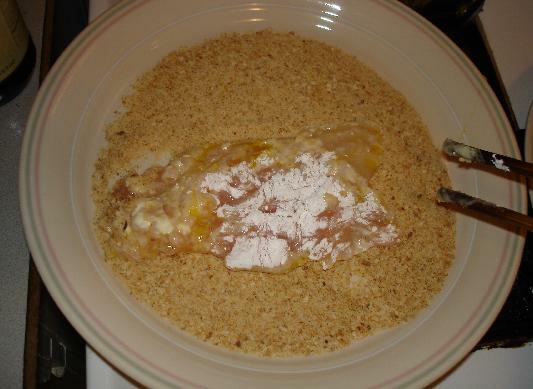 Finally, coat the chicken breast with some breadcrumbs. Try to make sure the entire piece is covered on both sides. 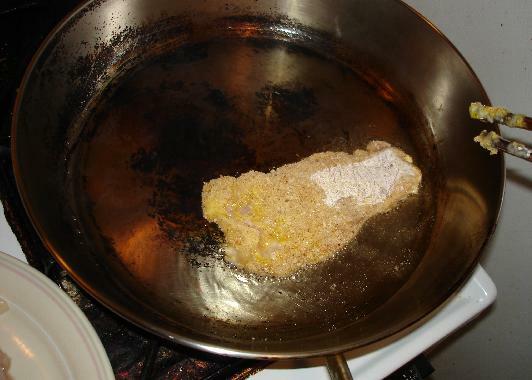 Lay the chicken breast flat on the frying pan. 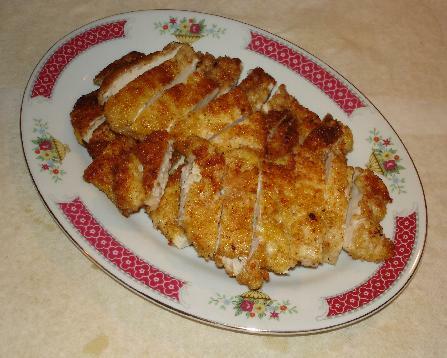 Shallow-fry the breast until the crust turns golden brown. About 3 to 4 minutes on each side. Fry multiple pieces at a time. 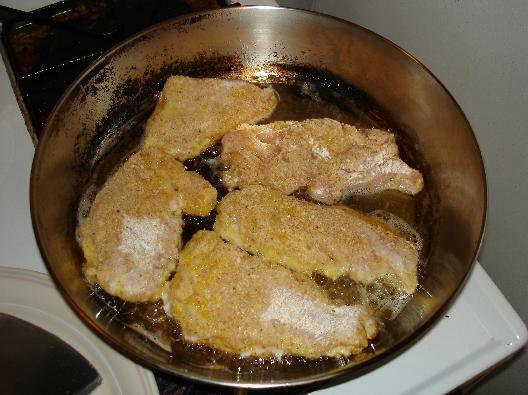 When both sides have turned golden brown, remove from pan and lay on top of a paper towel to absorb the excess oil. Continue with another batch of chicken breast patties. Cut each piece of chicken breast patty into bite-size. Assemble the cut chicken breast patties on the dinner plate. 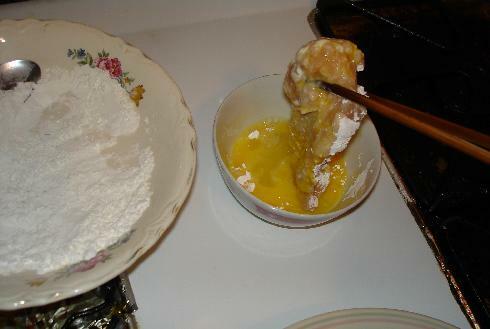 After the lemonade has reduced in half, use corn starch slurry (suggest: about 3 tsp of corn starch with 3 tsp of water. Adjust as necessary.) to thicken the sauce to the right consistency. 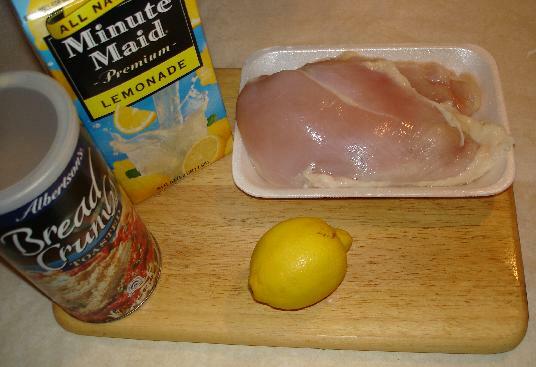 Pour the lemon sauce onto the chicken. 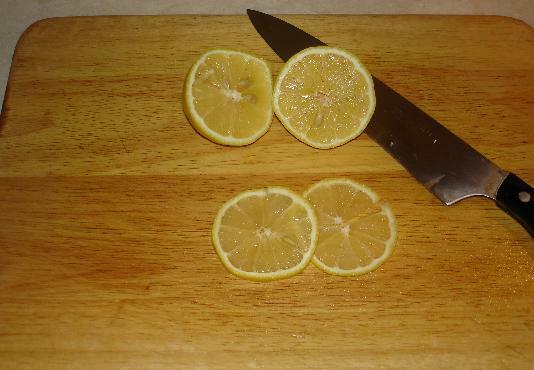 Add a piece of lemon slice as garnish. Finished. That's a very interesting version. The last time we had Lemon Chicken in a restaurant it was flourescent yellow that was nauseating to look at and didn't really taste very good either. I just read the recipe to my adult daughter and she said it sounded good. This looks extremely appetizing. Thanks. How sweet is the resulting dish? I like lemon chicken dishes that are sour. I hate the gloppy, horribly sweet lemon chicken that's standard in Chinese restaurants in the US. Really, I hate it so much I consider it a bane of existence. No offense intended to anyone. How sweet is the resulting dish? I like lemon chicken dishes that are sour. I don't like lemon chicken that is overly sweet either. My version of 5 to 6 tsp of sugar to 1 1/2 cup lemonade (reduced), with juice from one fresh lemon (note: no extra vinegar is needed) has just the right sweet-to-sour ratio in my taste. For those who like the other recipes I posted, I think you will like this version. Hzrt - I was going to mention your sugar/lemon juice ratio also. I like it! But I've never used lemonade before or even tasted that particular lemonade. I guess it is not too sweet, since you don't like that cloyingly horrible sweet stuff either. A good Lemon Chicken is hard to find in the US - apart from a place that attracts Chinese diners. The overly sweetened stuff that is so popular has given that good dish a bad name. [...]But I've never used lemonade before or even tasted that particular lemonade. You never had Minute Maid Lemonade? It tastes pretty good. Joanne, I think that a lot of Chinese-Americans like the really bad disgustingly sweet American-Chinese stuff, too. I frankly would probably avoid ordering lemon chicken in any Chinese restaurant in the US. If I saw it on a menu in Malaysia or Hong Kong or China, I'd ask whether it was sweet or not before deciding whether to order it. I recall seeing Martin Yan cook a rendition of Lemon Chicken that looked just like bad restaurant versions to me. Anyone else see that demonstration? My wife and I used to love lemon chicken in Chinese restaurants in NYC back in the 1980's, but then either the preparations started getting too sweet or our tastes changed. I made this dish for dinner tonight with your recipe and used even a little less sugar than you suggested. It was excellent. Thank you for restoring my faith in this dish. I served it with steamed broccoli and rice with bacon and scallions. My wife and I used to love lemon chicken in Chinese restaurants in NYC back in the 1980's, but then either the preparations started getting too sweet or our tastes changed. docsconz: Thanks for your feedback. That's my feeling exactly too. Some of the lemon sauce they use in restaurant is nothing but a big blob of yellow, which looks a bit scary. I confess I've managed to enjoy even the scary-yellow-sauce Americanized lemon chicken--but only when I get the sauce served on the side, so I can ignore it if I want to. But this version with the lemonade and lemon looks really inspiring. I may give it a whirl sometime real soon, possibly reducing the sugar even more so it gets *really* tart. hzrt8w, I think I may have said this before, but I'll say it again: I am so incredibly grateful for your pictorials. Ever since I shared a dorm kitchen with some grad students from China, I've been dying to get some lessons on real homestyle Chinese cooking of the type I saw those students do. So, many thanks for fulfilling that wish! --and also emboldening me to add ingredients like fermented bean curd to my personal cooking arsenal. [...]Ever since I shared a dorm kitchen with some grad students from China, I've been dying to get some lessons on real homestyle Chinese cooking of the type I saw those students do. So, many thanks for fulfilling that wish! mizducky: Thank you very much for your kind words. This sure has shifted my future pictorial publications a bit towards the Chinese-Chinese side in the food spectrum. Ah Leung, I've been thinking why Chinese restaurants serve the Lemon Chicken dish so sweet? 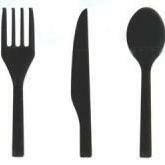 Isn't it more a reflection of the customer's taste, and not necessarily the cook's abilities? I don't think it's economics: How much does lemons cost? It seems to be a gradual movement to what we have today. Not only Lemon Chicken. Other examples: Orange Beef, even "Mongolian Beef" is sweet - offered at Pickup Stix. I agree. So was the chop suey, and the 6-inch long "egg roll". They probably feed on to each other: the more cooks make it that way to satisfy customer's taste, the more customers are misled that's what Chinese food is supposed to be, and thus create more demands for the altered Chinese food. Frankly, how many Americans have been to China to taste their Chinese food? How many go to places like Pickup Stix, Panda Express and other small mom-and-pop Chinese kitchens in towns that have low Chinese population? Ah Leung Gaw....really yummy-looking lemon chicken. I always make lots of extra sauce to put in a gravy boat. The kids love flooding their chicken with tanginess. That looks so much better than the flourescent-yellow variety one sees in many restaurants. I think it's interesting that you use lemonade for your sauce. Haven't tried making this at home, but I have made Chicken Francese with Lemon and Pecorino, which has a nice lemon sauce. I think I'm going to do a side-by-side comparison one day. Of course, we're talking two different cuisines, but the preparations are somewhat similar, so it'd be intersting to see what my "offical taster" thinks. I even like extra lemon sauce on rice! I have one more store to try before I become sad. Really? Wow! Japanese don't drink lemonade? You can use juice from fresh lemons. I was just being lazy. Maybe use the juice from 5 lemons. No need to reduce (they are quite sour). Just add a bit of water and sugar. There's a Japanese brand of lemonade that I quite like. It's called Suppin Lemon. Not too sweet, but you may need to add a bit more lemon (or less sugar) to the sauce recipe. It is most commonly found in the 250mL tetra paks, but sometimes you can find it in a 1 litre carton. It's mostly yellow, with a white middle part with the name in hiragana (I think the letters are outlined in green....). I found a picture of the tetra pak here. The Japanese really like lemon flavored drinks but they are usually the carbonated versions. I know that one of the International markets by me sells a pink lemonade in a bottle, but I was worried about what color the dish would be. I don't know how much of a difference it makes, but as I was looking for a picture, I found out that it's marketed as a health drink. It has collagen in it. I don't know if that would make a difference in the final product--maybe try a tetra pak first, and see how that goes? I've been craving it, too, and a couple of days ago I went out and bought some chicken so I could start. But after I got home, I realized that I forgot the lemonade! Oops! It's my project for Sunday, though! Ah Leung - it's like you're channeling my mom with all your pictorials. Sounds like another family of fellow Cantonese. Made this for this evening's dinner. I usually eat alone due to our conflicting schedules but I was happy to have my wife join me this evening. I made this using the same methods that you posted above and not only did it look the same, it tasted outstanding. It's the tartness that does it. I had figured that going in so I whipped up some rice with some peas and egg. I was figuring that the peas sweetness would be nice contrast to the twang contained within the sauce. And it was. Ive made 2 so far..and that Oyster pot is looking mighty intriging!